Hank Philippi Ryan will be discussing her most recent book, the acclaimed standalone psychological suspense thriller TRUST ME, an Agatha Nominee. Suspense Magazine's reviewer calls it "By far one of the best thrillers I've read in years." The Booklist starred review says “a knockout!” and New York Post, BOOK BUB, PopSugar, Real Simple Magazine, CrimeReads and Criminal Element named it one of the Best Thrillers of 2018. 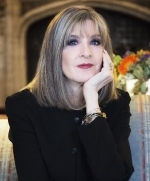 More about the author: Hank Phillippi Ryan is the on-air investigative reporter for Boston's WHDH-TV. She's won 34 EMMYs and dozens more journalism honors. The nationally bestselling author of 11 mysteries, Ryan's also an award-winner in her second profession — with five Agathas, three Anthonys, two Macavitys, the Daphne, and for THE OTHER WOMAN, the coveted Mary Higgins Clark Award. Critics call her "a master of suspense" and "a superb and gifted storyteller" and she is the only author to have won the Agatha in four different categories: Best First, Best Novel, Best Short Story and Best Non-Fiction. Her novels have been named Library Journal's Best of 2014, 2015 and 2016. Her 2019 book is THE MURDER LIST, coming in August. Capacity: 98 of 125 spaces available.